The Oppo F5 Youth is the shed-down version of the popular Oppo F5. Oppo F5 Youth is set to debut in the Philippines this weekend. As the name suggest, the handset is specifically tailored to the younger smartphone users this holiday season. The Oppo F5 Youth is also an A.I. Beauty Technology-powered handset; it also brings some great features from the recently-released Oppo F5. For one, the Oppo F5 Youth features a 6-inch FHD+ full-screen display with 18:9 aspect ratio. Other essential tricks like Facial Unlock and game-first technology are also retained in the handset. 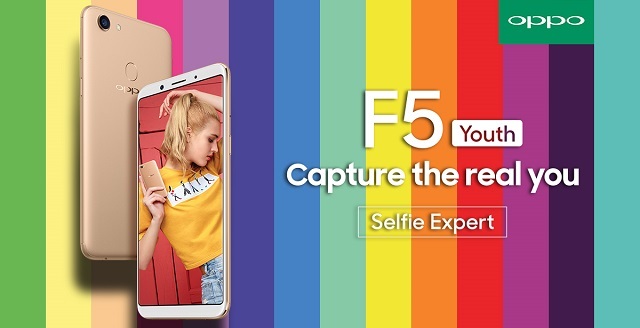 In terms of the camera, the Oppo F5 Youth takes advantage of the 16MP Selfie camera and Oppo's proprietary A.I. Beauty Tech. On the flip side, the handset comes with 13MP sensor for great point-and-shoot photos. The Oppo F5 Youth is powered by a 2.5GHz octa-core processor coupled with 3GB of RAM for faster multitasking experience. It'll boot with Android Nougat with ColorOS 3.2 UI which the company claims to be 23% faster in app launches. The Oppo F5 Youth will be available starting November 25 at Php 13,990. In line with this, Oppo will also be giving a paint-job to their flagship store in SM Megamall on the said date. First 30 customers to purchase an F5 Youth will receive a Bluetooth headset starting 3PM onwards. The Oppo F5 Youth will also be available nationwide in all Oppo stores and partner dealers.